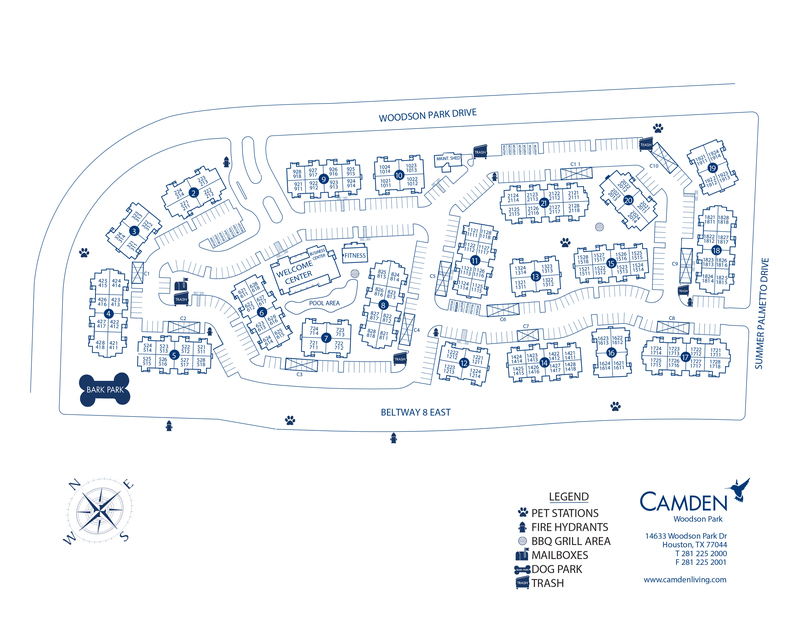 Camden Woodson Park features luxury one, two and three bedroom apartment homes nestled in the tree-lined trails of the Summerwood neighborhood in North Houston. Our pet-friendly apartment community is a peaceful and relaxing place to live, with Lake Houston and Deussen Park just minutes away. Get out in the fresh air during your weekend errands and take advantage of the H-E-B Grocery Store within walking distance. Residents enjoy easy commutes to Downtown Houston and George Bush Intercontinental Airport with direct access to US-59 and Beltway 8. Our convenient location is also zoned to the highly acclaimed Humble ISD and only minutes away from the Golf Club of Houston and Generation Park. Enjoy access to the best resort-style pool in the city, with waterfalls, outdoor grilling and dining areas, and even a shallow splash pad for the kids. Stay in shape in the fitness center filled with cardio equipment and free weights, or entertain your friends in the media room or social lounge complete with kitchen and WiFi. Need a place to host a business meeting or a quiet spot to work? Our Business Center has several computers, a printer and an adjoining Conference Room with nearby coffee bar. At Camden Woodson Park, pets are family too! We offer a one-of-a-kind, fenced-in, private dog park with pet washing station for them to enjoy. Our North Houston apartments look like a neighborhood of beautiful cottages, featuring private entrances and stairwells, surrounded by lush landscaping. Each apartment feels like a luxury home with features like kitchen islands, wood-style flooring, garden tubs and large walk-in closets. Enjoy the convenience of having a washer and dryer inside your apartment, as well as plenty of storage and built-in desks and bookshelves. Residents receive a technology package included in the total monthly rent with a savings of up to 53% off retail. This money-saving package includes high-speed internet up to 150 Mbps and over 140 digital video channels with 80 HD channels through Xfinity. Use the Xfinity Go app on your smartphone or tablet to access your digital video anywhere! Ready to make Camden Woodson Park your home? We can’t wait to have you! View our available apartments here. At Camden, your pets are family too! We welcome cats and dogs, up to three pets per apartment home with no weight limit. Call us with any pet-related questions! Breed Restrictions: We do not permit American Pit Bull Terrier, American Staffordshire Terrier, Staffordshire Bull Terrier, any mix of the previous breeds, or any other dog or breed deemed aggressive. Get the perfect spot! We have open parking for our residents and a designated area for Visitors on a first-come, first-served basis. Covered spaces are ready for you to rent! Carports are available for $40 per month.